This Rosemary Garlic Popcorn is drizzled with a buttery mix filled with fresh rosemary and a hint of garlic. Simple, easy, and perfect for on-the-go entertaining, this crunchy snack is sure to be the hit of any party! It’s mid-July and summer is in full swing. How are you celebrating the summer months? Despite a busy season full of graduation parties, get-togethers, and more, the hubster and I have been trying to make the most of the warmer months. Since we live in the suburbs of Chicago, there are about a million festivals, events, etc. going on every weekend. And I’m not complaining! I love living near Chicago…we’re just about 35 minutes away and can easily drive into the city to find some new festivals, bars, or restaurants to visit, or we can explore one of the many towns in the suburbs. And nothing beats sitting outside with some food, drinks, and enjoying the warm weather. Whether it’s listening to a concert, exploring a festival, or entertaining in our own backyard, this is what summer is all about. Of course, since I’m a food blogger, I love entertaining with some adult beverages and snacks. 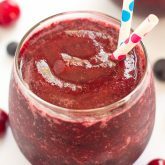 Nothing screams summer more than some delicious food and cold drinks. Am I right? 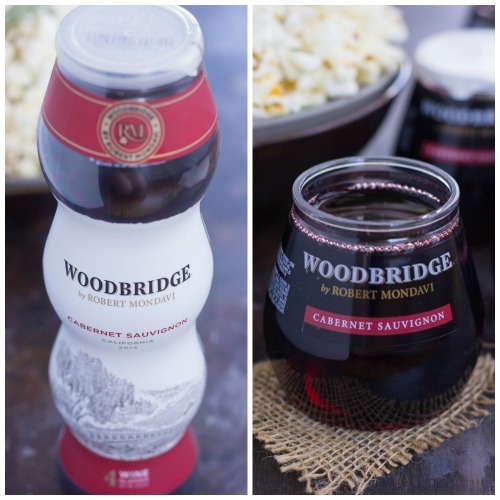 Last week, I stumbled upon Woodbridge Wine by Robert Mondavi Chardonnay & Cabernet Sauvignon. Have you seen this? With this wine, you don’t have to sacrifice quality for an on-the-go drink. It’s a convenient way to drink wine, no matter where you are, in a single-serve format. Woodbridge Wine by Robert Mondavi has been around for over 30 years and is a product that you can trust. It’s made for sharing and can make any occasion fun. And since it’s a wine that is single serve and perfect for summer events, I knew this drink would become a favorite of mine. After I stocked up on Woodbridge Wine by Robert Mondavi Cabernet Sauvignon, I headed home to pair it with a savory recipe that’s made for summer festivities, parties, and picnics. Popcorn…you really can’t get much easier than this, right? The crisp texture, savory flavor and irresistible crunch was made for popcorn lovers everywhere. And if you’ve never tried a savory version like this Rosemary Garlic Popcorn, then you’re in for a real treat. I love using fresh rosemary whenever I can. It’s fragrant and makes any dish come alive with flavor. And that’s why it pairs perfectly with the mixture of butter and garlic. And like most of my recipes, this Rosemary Garlic Popcorn is a breeze to whip up. Simply stir together some melted butter and garlic powder until combined. Then, pour over a bowl of popped popcorn, top with fresh rosemary, and toss everything together. And that’s it! I guarantee this popcorn will become your new favorite snack for the summer. It’s convenient to bring to parties, picnics, or just for entertaining in your own backyard. 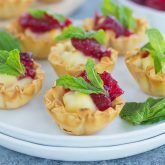 Serve this savory snack with Woodbridge Wine by Robert Mondavi Cabernet Sauvignon and your summer festivities will be the hit of the year! Check out the EntertainAndPair for more great entertaining ideas! You can also find Woodbridge Wine by Robert Mondavi Cabernet Sauvignon on Facebook! In a small bowl, microwave butter on medium power until melted, for about 1 minute. Remove from microwave and add rosemary and garlic. Stir to combine. Pour butter mixture over popcorn and lightly toss to coat. I love Chicago. I used to go there all the time, and it holds a special place in my heart. As does this popcorn, which is the best. I love rosemary more than all other herbs! Perfect with wine! Thank you, Mir! Isn't rosemary the best? I just love the smell...it does wonders in dishes, too! My garden is currently exploding with rosemary and now I think I know exactly what to do with it! I mean, this popcorn looks completely dynamite, Gayle! I'm a liiiittle worried though that I would never be able to stop eating it! Thank you, Sarah! I definitely couldn't stop eat this popcorn! Thank you, Keri! I've made a rosemary parmesan version too and it's one of my favorite snacks! I love Chicago too, Gayle and I haven't been there in forever! There's nothing better than sitting outside in the beautiful weather eating snacks and drinking wine. 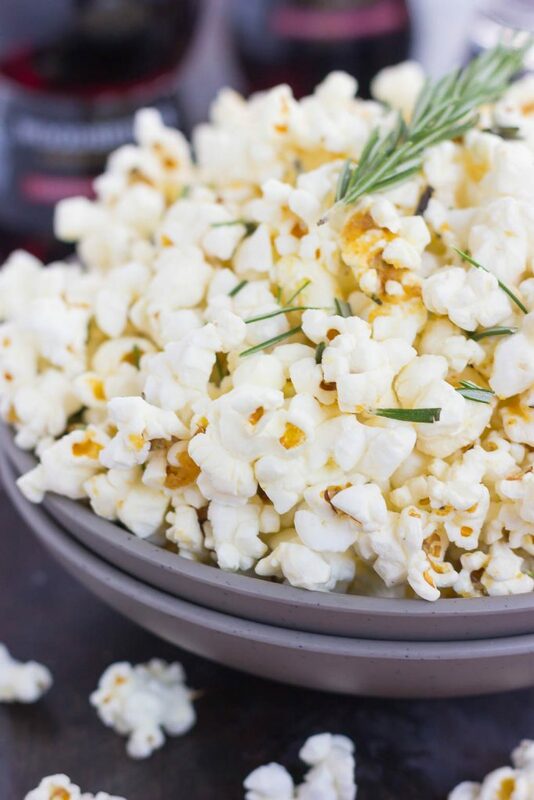 This rosemary popcorn is the perfect party snack! Pinning! 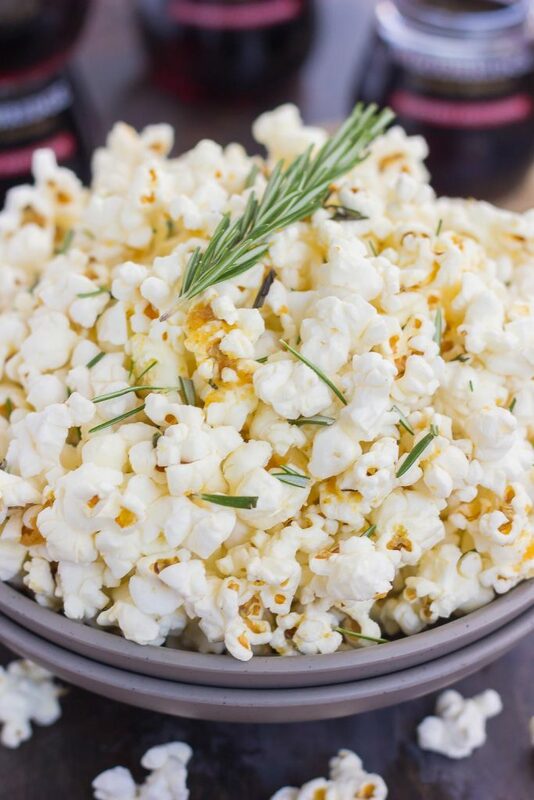 I love popcorn for snacking and adding rosemary is a great idea! Summer time is perfect for all the outdoor festivals. I hope you get to enjoy many! Thank you, Kathy! Popcorn and rosemary were meant to be together! Gayle! How did I not know that you live in the suburbs of Chicago?! I'm in Madison! We should meet up the next time I'm in the city! Ok, I LOVE this popcorn!!!! I love rosemary garlic anything! this popcorn looks amazing!!! Ahh we are not far at all, and yes, we should meet up! :) Thanks for the popcorn love, friend! Thank you, Kelly! Rosemary definitely makes the popcorn extra special! Oh that wine to go container is the best idea ever!! So cute! Love that I can have my wine when ever. Ha! I love this homemade popcorn. I love making popcorn, but always forget about it. It's such an easy snack too. The rosemary and garlic sound so good. We also have a ton of festivities here too, but it's to darn hot. Ha! Isn't it great? No need to carry a wine glass, just grab 'n go! Thanks for the popcorn love, friend! This popcorn looks fantastic!! Popcorn is one of my favorite snacks ever, and this version looks to die for! Rosemary is my favorite herb (besides basil)! :) Thanks, Medha! 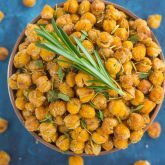 Rosemary garlic popcorn?! Oh man that sounds like the best flavor combo!! Especially when you're pairing it with delish wine. ;) Love this post, Gayle! Thanks, Alyssa! Popcorn and wine make the best combo! I love all how many fun outdoor events and get-togethers there are in the summer! This popcorn would make the perfect easy snack for guests! 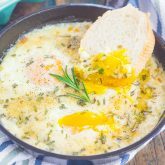 Love the rosemary garlic combo and the wine sounds awesome! Thanks, Kelly! I just can't resist popcorn and wine! I don't think I could ever eat enough of this awesome popcorn. The rosemary garlic flavor makes it so grown up. I image it's perfect with a glass of wine! I bet this smells amazing! 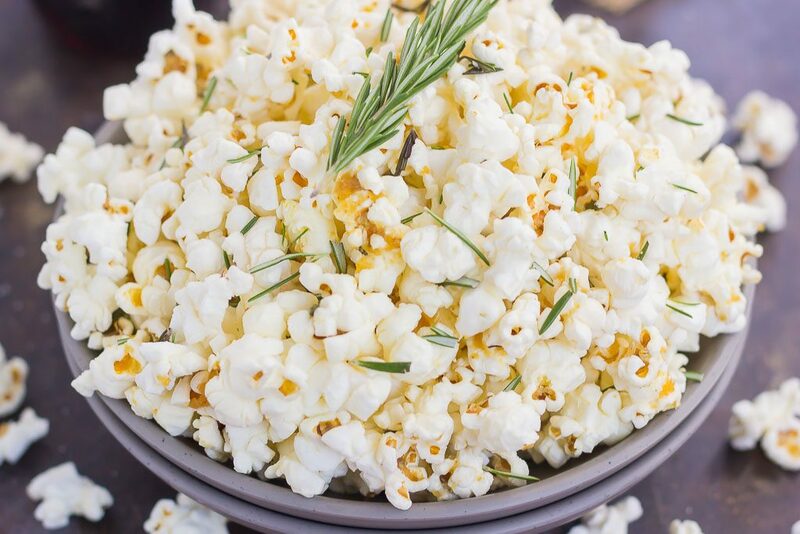 Rosemary and harlic is one of my favourite flavour combinations and I just love popcorn as a snack, especially when watching a film. I love popcorn especially when it sounds this flavorful! I wouldn't be able to stop snacking on this! Can you believe I've never been to Chicago?! I feel like that's some sort of illegal considering people used to call me Chey-town in high school. lol. ONE day I will get there! Anyways, single serve wine?!! Holy bologna, that totally has my name on it. I am a popcorn addict, so this flavorful, pop-tastic creation definitely needs to happen in my house! Rosemary and garlic? Sign me up! Looks fabulous, Gayle! Pinned of course! Cheers! You've got to experience Chicago sometime, Chey-town! :) Isn't single serve wine great? Thanks for the kind words and pin, friend! Popcorn (and wine!) are two things I love...in fact when I have a glass of red at night I almost always have popcorn with it! The flavors in this popcorn sound so delicious, Gayle -- I love the rosemary and garlic here. This is my idea of the perfect snack! Thank you, Marcie! I agree, red wine goes perfectly with popcorn! 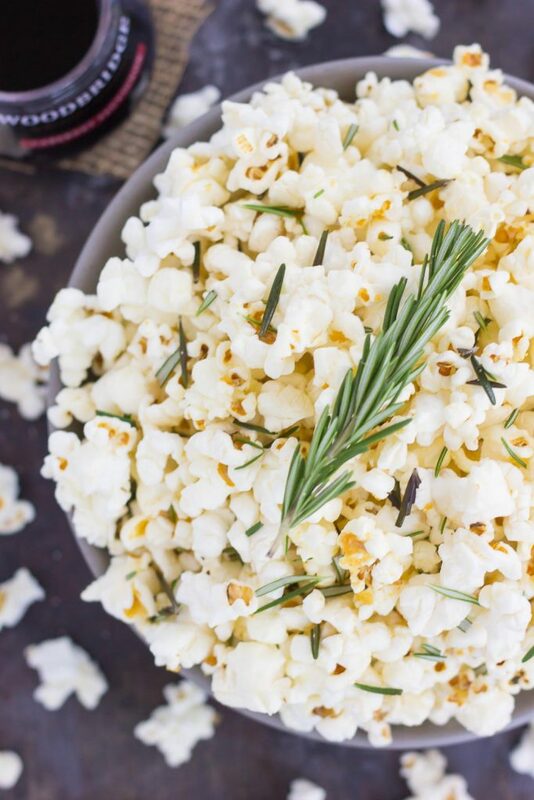 I love popcorn as a snack and this looks amazing with all that rosemary! Isn't popcorn the best? I could snack on it all day, too...especially when wine is involved! :) Thanks, Demeter!